Founded in the living room of James William (JW) and Cleo Glidewell’s first home, Glidewell Distributing has grown from a single delivery truck to eight digits in annual sales and a fleet of trucks. But we have not forgotten our past. In fact, we celebrate it and we invite you to read about the history and evolution of Glidewell Distributing. A business and a son were born in the same year… and with that, a legacy. In 1946, the Glidewell Distributing Company was founded in the living room of a man stricken by a bad case of the flu and as it turned out, a good case of luck. 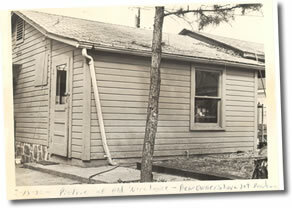 James William Glidewell and his wife, Cleo, lived in a cozy home on South 26th Street in Fort Smith, Arkansas. James, known as “JW,” provided for his new family as a tobacco salesman, number one in his distribution company. One morning, he awoke too ill to work and was informed by his boss that a sick day was a day without pay. JW recuperated and never missed another day’s work at that company. He resigned from his position and started his own distribution company. With his wife’s assistance, and a panel truck he acquired through a trade with his beloved Packard convertible, JW began buying inventory from local suppliers and created his own route, selling and delivering tobacco, groceries and sundries from the delivery truck that bore his new venture’s name and phone number: Glidewell Distributors -22539. That same year, a son, James Andrew Glidewell, was born to JW and Cleo. A photo of a proud father supporting his year-old-son on the front fender of the panel truck captures the essence of that pivotal year- 1946. Today, that photo is displayed in the office of a bustling compound of warehouses and computer screens, loading semi-trucks and intercom directives. Jim Glidewell, an animated, smiling man whose photographed infant face absorbed the fiery determination in his father’s eyes, sits today in his sunny and spacious office, surrounded by the workings of a company that now services over 1500 accounts in western Arkansas and eastern Oklahoma. The little business outgrew the family’s home, turning every garage in the neighborhood into a warehouse. JW devoted 14 hours a day to his company, committing himself to the relationships and expectations of suppliers and customers, his wife equally busy with the checking in of freight and sales from a desk in the living room. By 1959, even the garages lining the Glidewell alleyway were inadequate in meeting the needs of Glidewell Distributing. JW bought property on North 31st Street, in the midst of what was then the industrial warehouse district of Fort Smith. The expansion continued. Of the many relationships which defined the Glidewell venture, a particular name and name brand became signature in the company’s inventory and in the national consumer’s lexicon. Frito-Lay. The snack company which was initially itself a wholesale distribution service, Frito-Lay was the result of Herman’s own and America’s favorite potato chip and his acquisition of the distribution rights to a little-known corn chip concocted in a Mexican kitchen. Herman Lay and JW found friendship and business to meld. 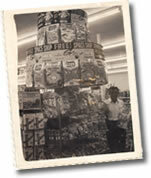 Glidewell Distributing was one of the final two such companies to maintain a Frito-Lay wholesaler profile, a lucrative and demanding partnership that ended only when the snack company ultimately incorporated its own distribution system in the late 1960’s, with the merger of PepsiCola. Over the years, JW had diversified his inventory to include not only candy and snacks but drinks, groceries and a wider selection of candy. The evolution of the convenience store was reflected in the evolution of Glidewell Distributing. It was a new world. Tobacco, however, became a commodity and a political parlay. Its popularity in the 1970’s manifested into legal entanglements when tobacco meant big money and control. Permits to vend tobacco were granted by the companies that harvested the crop and they were, at best, difficult to attain without politically confluent efforts. JW applied for and was denied permits from a number of tobacco companies and, in typical form, fought for what was right. He sued the tobacco companies, the big tobacco companies. Philip Morris, R. J. Reynolds and Brown & Williamson were, in fact, on JW’s list. In 1972, in the evolving vending world, it was a David and Goliath battle. JW’s company finally won that suit, compensated with only the attorney fees and a license to continue business as usual. But Glidewell Distributing now had more to offer. The inventory now included snacks, candy, basic groceries and tobacco. By 1979, Americans had become a country of burgeoning mobility. An automobile was in every driveway. Highway systems were expanding and parking lots became a piece of the urban landscape. The emerging convenience store was on the rise, as well: intersections were marked by the “C-stores’” epidemic, a one-stop, park-at-the door, on-the-way shopping favorite. Those daily needs, gasoline, cigarettes, snacks, and basic groceries became daily c-store stops. Today, gasoline is still the most purchased product sold in the c-store and not surprisingly, tobacco has retained second place. Candy, snacks and basic groceries follow closely. By including the now-available tobacco products in their inventory line, Glidewell Distributing was a pioneer in the wholesale industry. “We were put down for trying to do what no one else had done,” Jim grins. Their comprehensive inventory only escalated the success and work of a still-growing family company. Sadly, however, that addition to the company’s success came the year JW passed away. “Dad never really saw the magnitude of our entrance into the tobacco world. 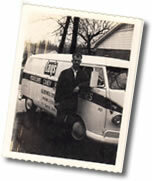 Nor did he see the improvements in our company when we switched to a dual system of sale and delivery.” Jim recalls. But, in 1984, the last year of JW’s life, the Glidewells were still doing best what they had always done. They were working hard. The number of employees grew, annual sales hit the eight digit mark and a new facility was imminent. It was, again, time to relocate into a larger workspace. This time, Jim sought property that would allow for long-term growth and security. 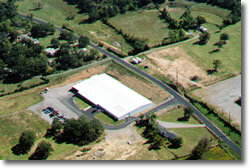 In 1998, a new location was identified. The Glidewell Distributing Company bought 20 acres south of Fort Smith and built a compound that is now surrounded by pastures. Just off of Highway 71 South, it is both a convenient location and a tranquil setting for the otherwise constant moving of inventory. Completed in 2000, the new grounds sits high on a hill and overlooks Glidewell land in all directions. “It’s good to be in charge of what you look at,” Jim states with a signature grin. Included within that purchase agreement was the acquisition of its customized computer system, complete with software honed and tested on the national market by Southern’s co-owner, Linda Evans Schmidt. Linda had grown up in the industry and recalls that, when she learned to add, she made the bank deposits for the Evans Tobacco and Candy Company. She witnessed firsthand the evolution of automation in her workplace, still amused by the awe and fascination she felt when the company’s first calculator was purchased. Large and complicated to use, the “piece of machinery” did nothing but multiply. Its impact, however, marked the beginnings of an innovative effort to integrate the use of computers for inventory and management control. By the time Linda and her husband and business partner, Kenneth Schmidt, decided to sell their company, they had become part of the technological revolution within their industry. Today, Jim notes, “Glidewell Distributing is the “only one still standing. “Indeed, while at one time, the Fort Smith area was headquarters to about a dozen wholesalers. Today, Glidewell Distributing is the sole wholesale distributor in the area and one of the largest in the region, providing full service to western Arkansas and eastern Oklahoma. While the growth of this successful family business continues, the promise for continued good work lies within the ranks of upcoming leadership and the welcomed challenges of the unknown: truly, the components of a proven legacy.